References are a vital part of job applications. For employers, they provide insight into how potential hires work from the people who know them best: their former managers. But what if your references reveal as much about your weaknesses as your strengths? To find out, SkillSurvey, a reference checking technology firm, analysed a random sample of thousands of confidential references and found there were five key areas that job seekers could improve on. They were: confidence, communication, knowledge, experience and time management. Lack of confidence was flagged in references for nearly every industry position. Retail workers were mostly likely to have negative feedback about knowledge and time-management skills. The five most common strengths in references were commitment, dependability, being a team player, attention to detail and having a positive attitude. The most frequently occurring trait was commitment, which was mentioned across the board about candidates seeking a range of different roles. Cynthia Hendricks, chief analytics officer at SkillSurvey, quoted in an article by Fast Company , said: "The research doesn’t necessarily suggest that people lack these skills, but it does show the most common areas where job references observe that candidates could stand to improve. Candidates not only need to improve certain skills, they also need to be prepared for employers’ requirements to change. The World Economic Forum’s The Future of Jobs report found that over a third of skills that are considered important for today’s workforce will have changed by 2020. Creativity will become one of the most desirable skills for employees to have, and critical thinking will also become more important. On the other hand, negotiation will drop in importance, and active listening, a key skill in today’s workforce, will drop out of the top 10. Emotional intelligence is another skill that is expected to become invaluable for employees, appearing in the top 10 for the first time by 2020. Have you read? 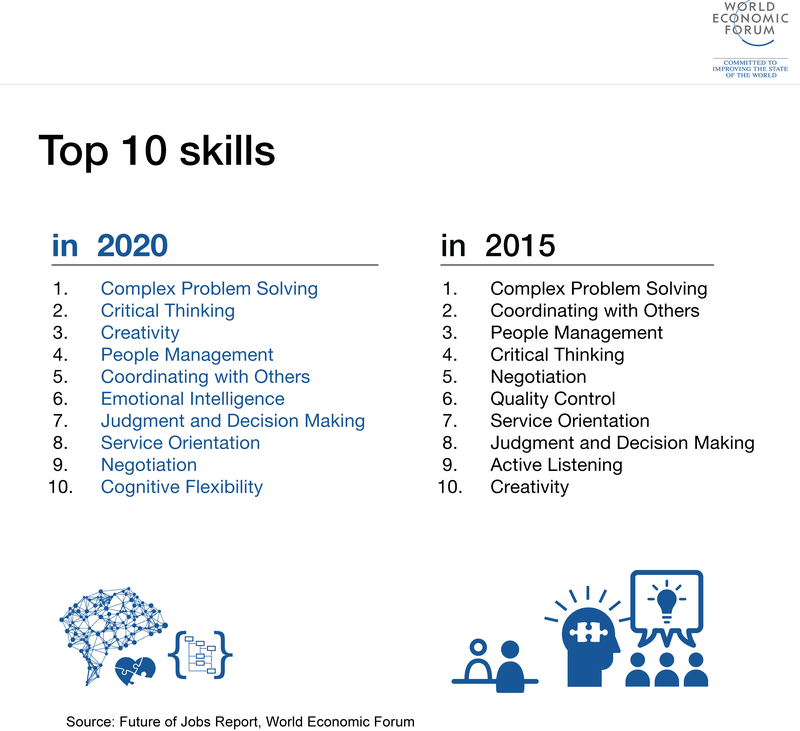 The 10 skills you need to thrive in the Fourth Industrial Revolution What are the 21st-century skills every student needs? What skills are employers looking for?